I wanted to make this a positive, up-beat campaign (with unicorns and rainbows as far as the eye can see) to save an endangered species in our area because I thought more people would be able to hear that message. But, that felt disingenuous. We are past that. I think most of us understand at an intellectual level that we have gotten ourselves into a big mess and need to make some major changes. But, on a different level, I think we also feel afraid and overwhelmed about the situation and feel helpless and hopeless about making changes; we don’t know where to start. So, the less intellectual part of us wants to hide under the covers or take a trip down that infamous river in Egypt. We can keep doing that if we want and it will feel better for the moment, but it’s not going to make the problem go away. Endangered species aren’t just disappearing from distant rainforests anymore. They are literally disappearing from our own backyards. These are creatures, like the rusty patched bumble bee, that were incredibly common 20 years ago and have now declined 87%; they are present in only 0.1% of their original range1. In the past, our idea of endangered species were these rare, exotic animals, killed by poachers for their prized fur or ivory; human impact on species felt far removed, an act created by villainous poachers. 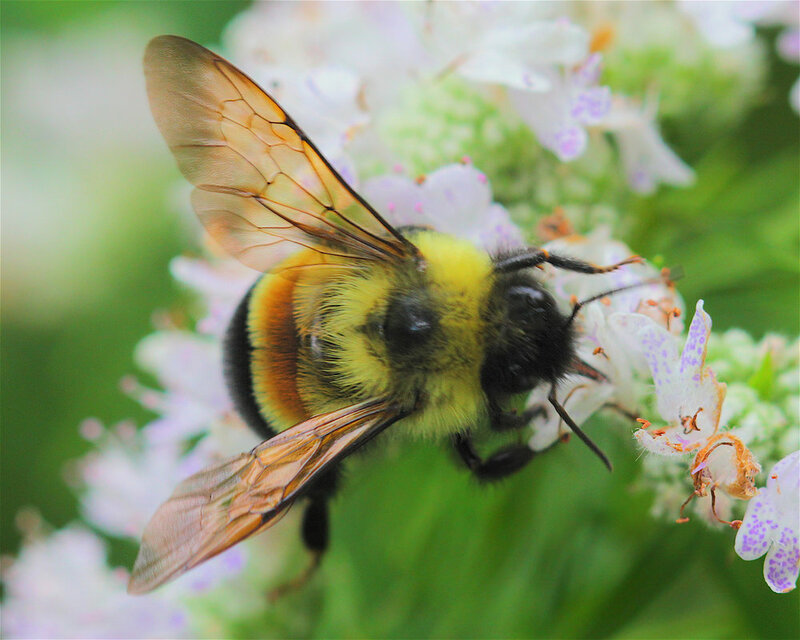 Now, species as common as bumble bees are going extinct. This isn’t something we can blame on poachers anymore. All of us play a role in the extinction of species; and conversely, all of us can play a role in turning things around and saving them. I think the first step is really becoming aware of our fears and our reflex to turn away (flight response). I’m going to cite some statistics and statements by environmental experts; start to notice how you react to them (are you engaged, do you shut down, do you question the validity of the statements, etc.?). An endangered species is like a canary in a mine2. That is, it signals that there is a big problem with the surrounding ecosystem. Humans are part of an incredibly complex ecosystem, and if the ecosystem has a big problem, we have a big problem. In 2017, there were only 191 expert-confirmed sightings of this endangered bee across the U.S. United States Fish and Wildlife Service projections indicated that the rusty patched bumble bee may become extinct in as soon as 5 years, if measures aren’t taken to protect it and its habitat. The rusty patched bumble bee is not alone; 1 in 3 bumble bee species are in trouble1. Further, 28% of mammal species are endangered and 50% are threatened at some level3; 33% amphibians are endangered and 43% are declining4. What did you notice? Did you feel flooded and want to turn away? Did you feel stuck and not know how to begin? Did you want to keep reading? It's okay to feel scared and overwhelmed with emotion, and it's even okay to want to turn away. That's a normal reaction to the mess we are in; a lot of people have this reaction (including me). Take good care of yourself and seek some support so you don't feel so alone (e.g., loved ones, an environmental organization, a therapist, books/written resources--Active Hope is a great book). Then, if you can, take action. I believe that if we got ourselves into this situation, we can get ourselves out of it; we can handle it (both the situation and how we feel about it). But, we need to take action now. Survival on this planet has historically required evolution. It is time for us to evolve again by changing our interaction with our planet. Rather than getting our needs met by exerting our power to make the planet work for us (e.g., tilling up land to plant food crops, bulldozing to build structures and urbanize), we need to begin to better understand how the planet works and begin to work with the planet to get our needs met (e.g., through the use of permaculture practices)6. This will require change, sacrifice, and hard work, but we really don’t have another choice. If we continue on this path, not only will the rusty patched bumble bee become extinct in the next 5 years, our species will not be far behind. We have the power to start a revolution and set an example for others right here in our own backyard. I know that making major changes and sacrifices might not sound desirable to us, but we don’t have a choice. We have to make a massive change in order to survive, and we can’t keep pretending that the problem isn't happening. "Look again at that dot. That's here. That's home. That's us. On it everyone you love, everyone you know, everyone you ever heard of, every human being who ever was, lived out their lives. The aggregate of our joy and suffering, thousands of confident religions, ideologies, and economic doctrines, every hunter and forager, every hero and coward, every creator and destroyer of civilization, every king and peasant, every young couple in love, every mother and father, hopeful child, inventor and explorer, every teacher of morals, every corrupt politician, every "superstar," every "supreme leader," every saint and sinner in the history of our species lived there--on a mote of dust suspended in a sunbeam. Our posturings, our imagined self-importance, the delusion that we have some privileged position in the Universe, are challenged by this point of pale light. Our planet is a lonely speck in the great enveloping cosmic dark. In our obscurity, in all this vastness, there is no hint that help will come from elsewhere to save us from ourselves. The Earth is the only world known so far to harbor life. There is nowhere else, at least in the near future, to which our species could migrate. Visit, yes. Settle, not yet. Like it or not, for the moment the Earth is where we make our stand. You can start by taking this opportunity for greatness; do the right thing and set an example for the rest of the world. Cliché as it is, knowledge is power: Educate yourself (see Resources page). Educate others, speak the truth, and advocate for major change. The truth comes from inside; we all know deep down that we are in serious trouble and that we have created this mess. Those who deny that are doing just that, denying the truth. Find small changes you can make. If we all make small changes, they will add up to a big change (e.g., unplug your electronics when you aren't using them--this could also help save 25% on your power bill; don't upgrade your phone every 2 years; switch from paper napkins and towels to cloth). Reduce, re-use, recycle. Recycling is great, but first, reduce your consumption, re-use items you do consume, and then if you can’t avoid throwing something away, compost or recycle it. Remember the old economic principle of supply and demand: If there is no demand for a product, prices will drop and it will go away; if there is demand for a product, prices may increase temporarily, but then production will increase. For example, if you stop buying chemically based agricultural products, there will be no incentive for farmers to produce them and they will go away; this means that pesticides, fungicides, herbicides and chemical fertilizer will go away and no longer pollute our planet. If you start buying organically based agricultural products, prices will increase (increased demand on a lower supply), but then farmers will realize that people want these products and will start producing more (and prices will drop again). You can sign a petition; a militia is stronger than a vigilante. If you want to help more but don’t know what else you can do or where to start, join an environmental organization. They can tell you what role you can play in helping Planet Earth. Donate money to an environmental organization. 1 Evans, E., Smith, T., Horton, A. (2017, 29 November). Minnesota Bumble Bees with a Focus on the Federally Endangered Rusty Patched Bumble Bee. Presented at the Minnesota Association of Environmental Professionals November Seminar, St. Paul, MN.